For a group whose music sounds so naturally organized there is much in Swedish polska masters Vasen’s back story that is haphazard, even fortuitous. This might be true of many musical relationships but somehow Vasen seem to have had more than their fair share of serendipity. For instance, were it not for the group’s nyckelharpa player, Olov Johansson’s uncle having to go into hospital and Johansson’s mother borrowing his nyckelharpa while he was undergoing surgery, Johansson might not have discovered the instrument that has become his own means of expression and a crucial element of Vasen’s signature sound. Then later, had the shower in the house they were sharing during a weekend retreat not been occupied when Johansson suggested to Roger Tallroth that they try playing nyckelharpa and the 12-string guitar that happened to be lying around, they might never have heard how well matched are the sympathetic strings of the Swedish keyed fiddle and the ringing strings of a 12-string guitar. How these heroes of Swedish folk music – a group so popular in Bloomington, Indiana that they have a street named after them there – came to appear on American jazz fusion troupe Snarky Puppy’s Family Dinner 2 album is another story. We’ll get to that shortly but in the beginning there were three fiddler players, Johansson, Tallroth and Mikael Marin, who wound up playing other instruments to create Vasen. “There was a bit of a folk wave in Sweden in the 1970s and 1980s and all three of us interacted in some way or another,” says Johansson as the group prepares to return to Scotland for a tour that includes an opening night concert during Edinburgh’s Tradfest. “This was a time when there was only one TV channel and building your own nyckelharpa had become quite popular. We’d go to these fiddlers meetings because there was music in all of our families and it had been passed on." After Johansson’s uncle had recovered and become aware of the disappearing nyckelharpa, his mother returned it and bought her own. Johansson learned to play it and some years later took it off to a winter market in Norway where a large group of musicians and folk dancers had congregated. By chance he and Tallroth were billeted together and it was here that Johansson uttered the fateful words, ‘Would you like to play some tunes?’ To which Tallroth replied, ‘No, I’m going for a shower’ before returning and picking up the 12-string guitar. One of the listeners took advantage of a break between tunes to say that the sound Johansson and Tallroth were making was the best thing he’d heard in ages and that someone should record it. In fact, he said, if no-one else recorded it, he would take it on himself. A few months later he got in touch, found out there out been no recording made and decided to start a record company, with Johansson as his first signing. By this time, Mikael Marin had joined Johansson and Tallroth and they discovered that having the mellow viola, rather than the fiddle, sitting in between the nyckelharpa and the 12-string guitar created a very distinctive sound. The recording came out under Johansson’s name and he called it Vasen. 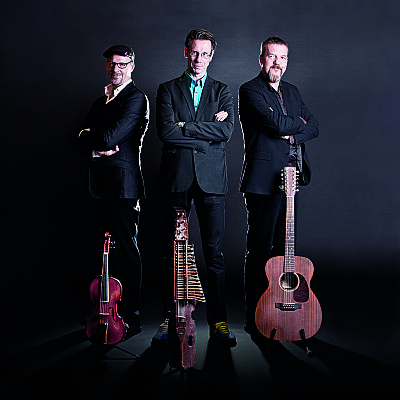 Cue much confusion among promoters and festival organisers who wanted to book Vasen, so the trio took their name from Johansson’s album, which in turn became the group’s first album. Another factor in their longevity is that they’ll go off and play in other situations. Johansson has a duo with Scottish harper Catriona McKay and the others’ involvement in side projects means that they all bring fresh ideas to Vasen when they reconvene after a break. Once they start working on new music it’s a question of refinement, taking a melody and making small adjustments in timing, dynamics and phrasing. Their string band status has found them welcomed into the bluegrass scene in the US, where fiddler Darrol Anger has been a particular advocate for many years. Mandolin virtuoso Chris Thile has been another champion of the group, inviting them onto his radio show, Live from Here with Chris Thile, and playing tunes with them and his own band, Punch Brothers at concerts and festivals. Johansson can just about understand the Swedish-bluegrass connection but the polska-jazz fusion connection that took Vasen into Snarky Puppy’s orbit is, he agrees, a more unlikely story. It’s one that begins with the American band’s bass player, Michael League teaching his Snarky Puppy colleagues a Vasen tune very early on in their development. Fast forward a few years and Vasen’s sometime fourth member, percussionist André Ferrari suggests they all go and check out this jazz group everyone on the music scene in Stockholm’s talking about – and Vasen end up onstage playing Swedish folk music with Snarky Puppy. From The Herald, April 11, 2018.